You are here: Home / Masterminds / Mastermind group fun in Perth in 2018: small business owners, bloggers, creatives and solopreneurs, apply here! Mastermind group fun in Perth in 2018: small business owners, bloggers, creatives and solopreneurs, apply here! 2017 was a great year for me for so many reasons, two of which are the fabulous mastermind groups I ran. My original 2016 mastermind group continued through the year and I added a second group as well. I wasn’t 100% sure how the second group would work out – my first group all had a lot in common, being writers and artists, while the second group had a really diverse range of small businesses – but I needn’t have worried, because they have all ended up helping each other out in ways I never imagined. Magic! What’s a mastermind group and why is it magical? I often tell people that part of what I do is run paid mastermind groups and pretty often they give me a funny look, so let me explain what they are! In my case, these are groups of four or five people (so far all women, but I don’t have anything against men!) here in Perth, who are either small business owners, authors, artists, solopreneurs, coaches, or have an online presence as part of their work and all of them want to do their work better. My mastermind groups have an emphasis on the social media and blogging aspects of promoting your work, but they regularly turn into more general small business advice – for example, recently the mini-training part of one of our sessions, by request, was about the most suitable invoicing software to use. But why are these groups magical? I think it’s because they are an example of the whole being far greater than the sum of its parts. I knew that I could help these people, and particularly that having regular meetings and a lot of accountability for tasks to achieve between meetings would help a lot, and it does. But there’s more than that. In each group, the individuals have made strong (and I predict, lasting) connections with each other, and each of them now feels that there are these other people nearby who have a thorough understanding of their business and a sincere interest in them succeeding. When you work for yourself, this feeling can be hard to come by, and that’s the magic. Want to know more about my mastermind groups for 2018? We meet three times per school term, for two hours each session, at my home office in Duncraig. Times are usually 9.30am on a weekday but this year I’m looking to add a group to meet 1-3pm on a Saturday. Each session includes checking up on agreed goals (your “homework”), some kind of mini-training on an agreed topic (usually, but not always, connected to social media, blogging or online strategy), ten minutes per person “in the hot seat” where we all try to help them with a particular problem or brainstorm, and then some time to agree on what homework you’ll complete before the next session. Each group has a secret Facebook group where you can ask me (and your fellow masterminders) questions, get feedback on your newest blog post or pretty much anything else you want or need! The cost for 2018 will remain at $175+GST per term – which is great value, if I do say so myself! If you’re after a bit more information you might find it in last year’s post about masterminds, but otherwise feel free to email me with any questions at all. 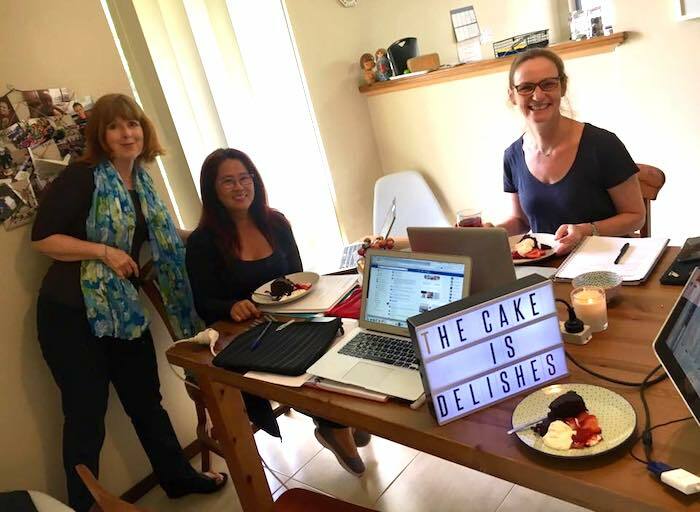 I asked my current wonderful mastermind ladies to give me a couple of sentences about why they like our mastermind groups – and here they are. As a local business woman who works alone, the mastermind class is the perfect opportunity to learn from other experienced business owners, a great way to learn new skills or check you are doing things correctly and my little piece of sanity. I cannot recommend these classes enough. I love the motivation and accountability Amanda’s mastermind class gives me; as a sole trader I really need this to keep me on track. I also love talking with like minded ladies and brainstorming ideas, getting feedback. I would totally recommend Amanda’s mastermind class not only for bloggers but for anyone who works from home. She is so awesome I am enrolling again next year. Amanda’s workshops are the highlight of my month. As a solo business owner it’s great to be able to get out and meet people, and the value that Amanda’s mastermind sessions offer are phenomenal. Sessions are structured yet flexible to suit the group so if you’ve got burning questions about any particular social media platforms you can ask away and learn what you need for your business. I highly recommend these masterminds for anyone who wants to learn as well as anyone who thrives when there is accountability in the mix too! Interested in getting more info? Email me at amanda@amandakendle.com and ask! No worries Tricia – have emailed you some extra information! Fabulous Victoria – I will send you an email shortly! Can’t wait to be part of a mastermind group, Amanda. So much I want to learn and do better. So happy to have you on board Maureen – you will definitely learn a lot – and get lots of support from the whole group. P.S. Looking forward to attending a second UWA Extension workshop of yours (the full day blogging workshop) to add to the fab Instagram workshop I got so much out of! Thanks Kay – have just emailed you to suggest a Term 2 start! A. Thanks Fiona – have just emailed you with more details for Term 2! Hi I’m interested in joining. Just setting out as a travel writer and want to learn more about blogging, creating a website using social media and how to target publications! I work as a researcher at ECU – that’s my day job!